Youngsters will be on the crest of a wave as Todmorden Gang Show celebrates its 60th anniversary in May - but they will also be saying goodbye to one of the revue’s diamonds. The special show, staged at the Hippodrome Theatre, Halifax Road, Todmorden, from Thursday, May 17, to Saturday, May 19 (7.30pm), will be producer Rowena Green’s last at the helm (centre in main picture). This year’s chosen charity reflects that, with Todmorden based newly-formed Music For The Many, which aims to give youngsters the best musical start in life through free-of-charge instrumental or vocal tuition, benefiting. Rowena first joined the show almost a quarter of a century ago and was in the producer’s chair for the golden anniversary in 2008. She will be bowing out in style with a show which promises plenty of razzle dazzle - and all that jazz! 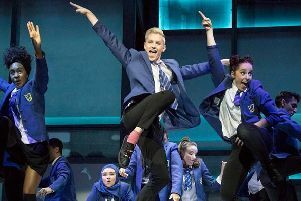 Musical highlights are set to feature a Mary Poppins routine for the Gang’s junior section and the seniors packing a triple punch through Three-Of-A-Kind’s Big Spender, All That Jazz and Razzle Dazzle, before the fast paced You Can’t Stop The Beat from Hairspray lands a knockout blow. Closing the first act are some classic “orphan” numbers including some from Matilda The Musical, based on Roald Dahl’s children’s book. In the second half watch for music from Beauty and the Beast and a different show closer to usual. Normally this is a reprise of numbers from the show but this time it will feature a megamix of Rowena’s favourite hits the Gang have performed over the years. She swears she doesn’t know exactly what musical director Chris Sawer has come up with except that it will include something from her favourites, the Bay City Rollers! Rowena, who hopes to return in some role in the future, said: “It’s been a great honour and privilege to have produced the 50th and 60th shows - but again I am also equally proud to have produced the numerous others in between. “I have however, after much soul searching, decided that due to health reasons it’s time to hand over the responsibility. I have achieved many goals from joining in 1995 and have been lucky enough during my stint to have taken on many roles within the Gang, so I know the hard work that goes on behind the scenes. Tickets are £8 for adults and £6 for children and senior citizens - but note there are no reduced rates for the Saturday performance. They can be booked online at www.todgangshow.org.uk or by ringing the ticket hotline on 07999 486116. Unsold seats may be available on the night but advance booking is recommended.